I have been a beer enthusiast since I could legally drink in the USA. A friend in California, where I’m from, introduced me to Belgian beers at that time and I fell in love and set out on a quest to try every style I could get my hands and mouth on. I moved to Seattle in 2006 and immediately got swept up in the craft beer culture there and started homebrewing. In 2010, I spent a summer backpacking around Europe where I drank my way through nine countries, enjoying a vast variety of beers. I decided to make beer my profession (I was working in law at the time). I returned to the U.S. and began working in the first of three breweries, doing everything from production/cellar work to brewing. I moved to Berlin in 2013 because I love Europe and had always wanted to live abroad. Once here, I began immersing myself in the local beer scene, visiting breweries and getting acquainted with the people behind the burgeoning craft beer movement. I started up a beer blog (www.berlinbierblog.com), and bartended at the Monterey Bar, as well as a pop-up craft beer bar put on by Beergeeks, a local distributor. Thereafter I began organizing Berlin Beer Week, the second edition of which just happened last month. I also organize „Sauer Macht Lustig,“ a small beerfest that showcases sour and experimental beers. 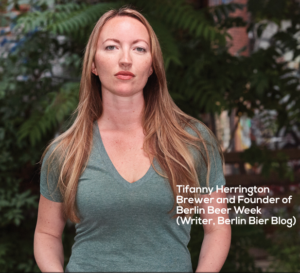 Meet Tifany in our panel discussion „Bierkränzchen“ at Braufest 2016. Marlies Bernreuther – Eine Frau, ein Wort!